October 5: can you cast it in glass? Then I set them so the tops of the thick ends would just poke out of the finished slab. The slab was taken to 1490F for 30 minutes. I used John Groth's recommended 5/8" ramp and anneal but slowed further to the Bullseye 3/4" annealing times. Both the CMC paste (rear) and the freeze 'n fuse (middle) show the usual faceting from the course frit (I intentionally didn't soften it with fine frit because I didn't want the bubble haze) but the Fuse Clay (front) kept its shape. The glass around it sloped up slightly rather than being level which tells me I wouldn't have wanted to go for any less heat. 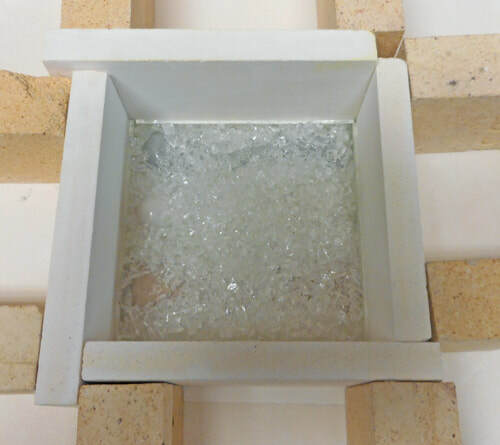 The protruding tips of the two all-glass pieces flattened down to the level of the clear glass and spread out as expected but the Fuse Clay stands proud of the surface. The beads of frit on it are an unexpected bonus. However the polarized view shows some tension at the thicker ends so I have more testing to do before making the planned tabletop. 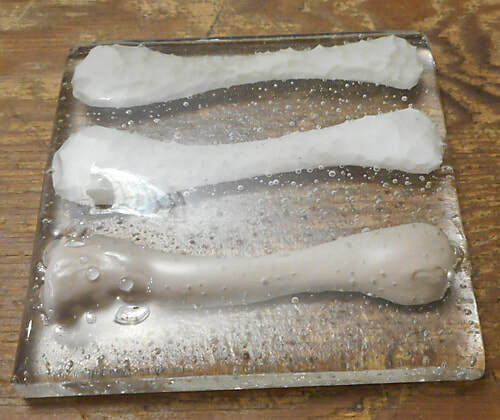 1) the Fuse Clay bone should have been bisqued for longer than the 10 minutes at 1500F so the casting didn't take it beyond the heat experience it had had before. The slightly larger number of bubbles clinging to its surface suggest there may be some out-gassing. 2) I maybe should have doubled the annealing time as Bullseye recommends for irregular pieces. Here's the second anneal: 1490 F again for 10 minutes and cooled following the Bullseye 1.5" schedule. Less strain but still some around the thicker parts of the piece. 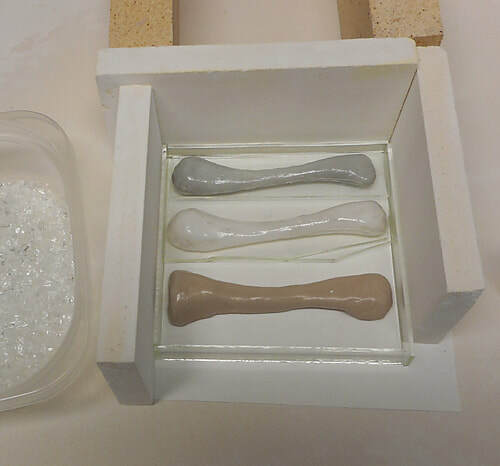 John Groth has been doing some refinements to his instructions and thinks that my problem is that the thicker parts were not fired enough to match the viscosity component needed for full compatibility (COE is just one part of it). He's working on firing schedules to hit the sweet spot for each thickness.